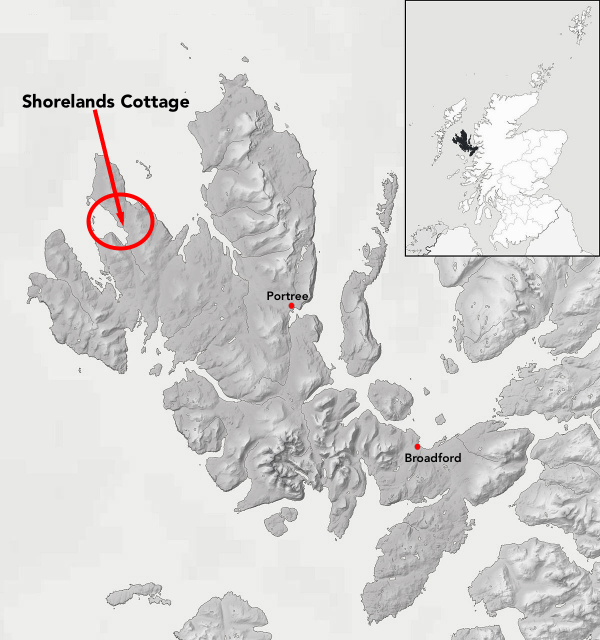 Welcome to Shorelands Cottage, a cosy self-catering holiday home on the beautiful Scottish island of Skye. The cottage sleeps up to 4 adults and 2 children. Dogs are welcome. This extended and renovated croft house has been brought to life with love and attention to detail. Furnished with a tasteful mixture of antiques, family heirlooms and modern pieces, the décor reflects the ambience: calm, cosy and steeped in the unique quality of the Isle of Skye. Fully equipped with all modern conveniences, you’ll feel in a home away from home while enjoying the secluded setting, as you truly get away from it all. Shorelands Cottage is situated on the Waternish peninsula of Skye, close to the famous Stein Inn and just a short drive to the historic Dunvegan Castle. With sea views from almost every window, it is the perfect retreat to enjoy stunning Scottish scenery. Peacefully located away from the main road, you can watch the sun set over the ocean, with the Outer Hebrides in the distance, from the comfortable sun room.